Highest Price Paid in Michigan for Gold! Shop around first and come to us last; we'll prove it to you. Whether you would like to sell gold or sell gold jewelry, Andre's Fine Jewelers, Michigan's premier gold buyers, will take the time to explain all aspects of your scrap gold. 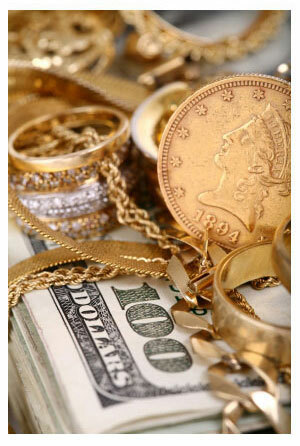 Andre's Fine Jewelers will prove to you that we are the best place to sell gold. You will be greeted in the safe and pleasant environment of our showroom in downtown Brighton Michigan to sell your fine jewelry. Our expert staff will evaluate your jewelry and quote you a price after analyzing it. We understand that customers wanting to know where to sell gold can find information from other gold buyers to be confusing. Andre's Fine Jewelers lists our gold price in both grams and pennyweights. This allows our customers to compare with other cash for gold buyers that are misrepresenting their scrap gold prices by quoting in pennyweights only. We weigh and test your gold in front of you. We post and update our prices daily on our website. The price of gold you see advertised for that day, is what you will get paid on that day. Do your homework, shop around, and come to us last. We'll prove to you Andre's pays the most. Unscrupulous buyers will try to convince you we will not pay the price advertised. They will tell you this price is only for new or select items. This is not true! We buy all types of gold at that price. and multiply that by the weight on the scale. lack of knowledge of the customers. you are getting what you got quoted. If you are looking to sell gold, sell gold jewelry or sell gold coins, Andre's Fine Jewelers is the perfect company to maximize your CASH PAYOUT!!! The following is a random sampling of our competitors offers to buy 14K gold compared to Andre's Fine Jewelers offer at the exact same time and date or a Secret Shopper sale on the same date. Follow through here for a more detailed list.